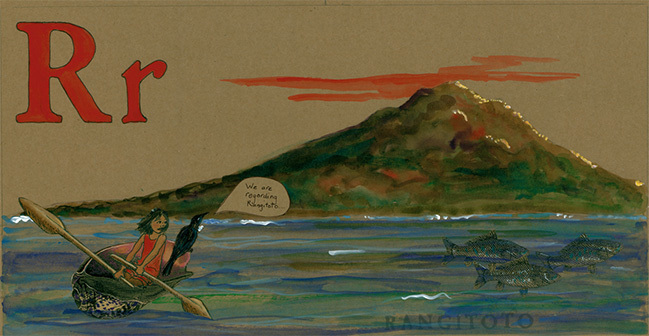 These years of working with children rekindled a desire to get art in front of kids in a really direct way. I have always loved book illustration, and clearly remember the illustrations from my own childhood reading that had such an influence on me. Writer Diane Newcombe, also a strong children's book enthusiast, came to me three years ago with an idea for a project that sounded full of potential. We were thrilled to get a Random House publishing contract, and the book comes out in stores November 1st of this year, 2013. 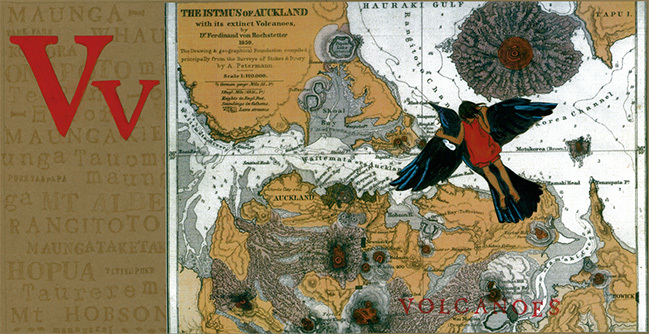 For more information about A is for Auckland, visit Random House. Over the last four years or so, I have been teaming up with well-known photographer and all around artist Deb Smith to run art workshops for bereaved children and children with a life threatening illness in their family. We work with a strong core team of volunteers who do a great job connecting to these kids. We run these workshops about six times a year with the support of Mercy hospice Auckland. 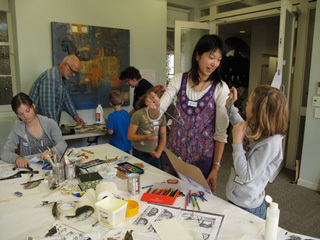 Making art with other children going through terrible situations gives kids comfort and support. For more information about Cloud Workshop, please contact Mercy Hospice Auckland at www.mercyhospice.org.nz. Our own Cloud website is under construction, and will be available soon. As soon as the ‘Paper” show was well underway, my husband and I travelled to Italy (my first time!!!) and stayed in Florence and Venice, with day trips to Siena, San Gimignano and Lucca. Seeing the work of some of my art heroes up close and personal was an inspiring experience. It was a long held dream of mine to exhibit with my brother Tim, and in April of 2010 we both took part in a group show in Chicago at the Beverly Arts Centre. The premise for the show came from a conversation Tim and I had about our works on paper that did not get exhibited with our works in oils, and how we wanted to get those works out into the open air. Tim connected with some artist friends, who all had works on paper they were keen to show, and the Beverly Arts Centre was most happy to stage the resulting show, called simply "Paper". I included some watercolour heads, both large and small, and some of the card works from my Personal Greed show of 2002, which had never been shown in the USA. "Paper" gave a group of eleven artists a chance to display a wide variety of works, and gave the public a chance to sift through piles of drawings and see the "nuts and bolts" of how art works are created. In 2008 I shattered my right arm, and it took quite a while to heal, so painting took a back seat for a while. 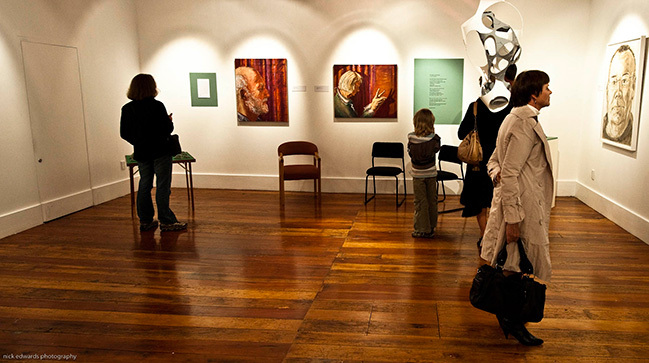 Over the course of 2008 and 2009, interrupted for a long healing time after the arm break, I developed an idea for a show of works that highlighted the relationship between an artist and the person who poses for them, the sitter. I decided to ask nine friends from a variety of creative fields to pose for portraits and create a work , in any medium, that reflected their experience while sitting for me. It was an amazing group of talent, with an actor, artists, an arts librarian, and my daughter, an Art Therapy student, all posing at various times. My daughter has posed for many paintings, and her portrait graced the invitation. The nature of the project meant that each of my sitters' work was exhibited alongside mine, so the show had lots of surprises in store for me! There were poems, a sculpture, some ceramic contour sculptural pieces depicting Mt Eden (where I live) that lit up, suggesting eruption, a peg doll inspired by Vermeer but with my face...fabric wall hangings made from antique tablecloths...and much more! A most fascinating group show experience. The first “Cloud Workshop” took place on Sept 21st. This is the start of a series of art workshops for bereaved children, developed by me and my friend Deborah Smith, one of New Zealand’s top artists in photography. 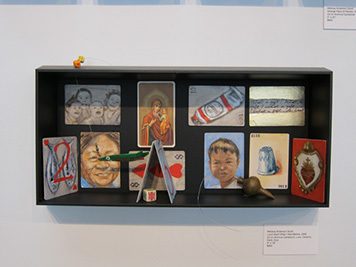 We based our first workshop on the art of Joseph Cornell, and sourced cigar boxes, collage materials, rubber stamps, etc, to enable the children to create personal museums about their dead parents or grandparents. 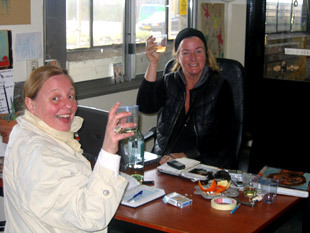 The session was a huge success, and the next one is planned for November 2008. For more information on “Cloud Workshop” please contact me or the Mercy Hospice, Auckland. August saw my return to Corban Estate Arts Centre and a large and ebullient class of oil painters. This group knew how to get what they needed! It was great fun for me to teach and learn from these students eager to get to grips with oil technique and still life. Friendships were formed and creative ideas shared, and by the end, we had an interesting and hugely varied body of work to reflect on. The trip to Chicago and New York went extremely well, with a lively group attending the opening of the “Five New Works” show at the Thomas Masters Gallery. I was able to meet and speak with the purchasers of the largest work, ‘Annunciation”, and was thrilled to discover that it was their very first art purchase! What an honour! A highlight amongst highlights in New York was a pilgrimage to The Cloisters, in the most northern part of Manhattan. The Cloisters house Medieval Art collection of the Museum of Modern Art, and was well worth the visit. It is famed for its tapestries, but I was even more drawn to some reliquary heads in the collection. A visit to the Frick, my favourite museum in New York yielded a wonderful book on Hans Memling. Corban Estate Arts Centre has asked me to return to teach a weekend workshop in oil painting. The workshop takes place on August 9th and 10th 2008. We will be working from still life, with an emphasis on luminosity. I hope to see you in August! Contact Shelley at the Corban Estate Arts Centre on shelley@ceac.org.nz for details of the course and how you can register. 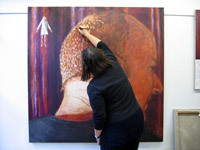 Work proceeds on paintings to be exhibited at the Thomas Masters Gallery in Chicago, in the USA (see below). I am bringing the work to the gallery on the second of June. 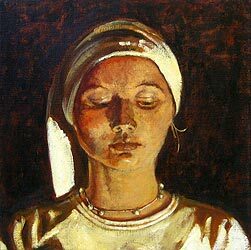 The paintings are a continuation of a series of “tronjes” or people paintings with the head wrapped in a towel or cloth. This is a subject that has interested me for ages. The wrapping of the head gives a timeless quality to a modern person which I find intriguing. To find out more about the Thomas Masters Gallery, please visit their Website at www.thomasmastersgallery.com. The hottest week of January was spent at the Corban Estate Arts Centre, teaching a lively class to paint in oils, both from still life and from a life model. I was most impressed with the progress made by the students, who ranged in age from 15 to 80! We had two days working from a still life I set up, and, for new students, a period of becoming familiar with the materials, learning how to stretch a canvas, mix a medium, etc. Then it was on to the many challenges presented by painting a living person…quite frightening for some. We were lucky to have Gina, a very experienced and relaxed model, who coped with the heat and the drama in fine style. A new addition to the body of work on my site is the series of small paintings following on from a show I was involved in at the Thomas Masters Gallery in Chicago in 2005. Check out Blue period for a description of the show and to see the works that have developed out of that concept. 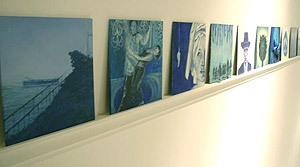 All the “Blue period” works are 20 x 20 cm, and are in oils on gessoed board. I have embarked upon a series of small works inspired by jazz music and its performers. 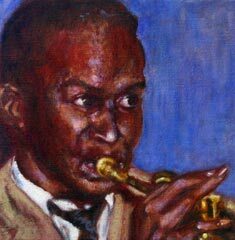 Painting musicians has always appealed to me, since it is a matter of capturing the moment when a person has completely forgotten about their exterior, and the concentration on an inner life is displayed on their face. The vibrancy of the jazz world prompts me to make these paintings colourful and joyful. Check the gallery very soon for a “Jazz” page, displaying these works. This summer I have been asked to teach at the Corban Estate Art Centre summer school. 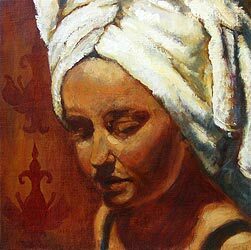 The course is titled “Understanding Oil Paint.” and will give me a chance to share some of the discoveries I have made in the course of studying this fascinating medium. The summer school runs from Monday, Jan 14th – Friday, Jan18th, and includes slide shows and artists talks by the tutors. For full details of the summer school, please see their website at www.ceac.org.nz. My trip to Amsterdam was fantastic. I had never been there for such an extended time, and having the whole month meant that I had the time to explore galleries, meet with artists, and see work in private collections in this most fascinating city. I travelled to Den Haag to see the Mauritshuis as I had planned, and found some works from their collection that I had never seen before! Two Rembrandts and some most exquisite still life paintings had been away on loan on previous visits, and seeing them was an added bonus. I was fortunate enough to be in contact with a local artist, Guda Stoop, who took me to the warehouse where the Night Watch project is underway. The artists involved in this project are working in an enormous (and I mean enormous) empty warehouse on a series of works that are the same dimensions as Rembrandt’s “Night Watch”, arguably Amsterdam’s most famous painting. Guda Stoop with Anne Rijke of the Night Watch Project. 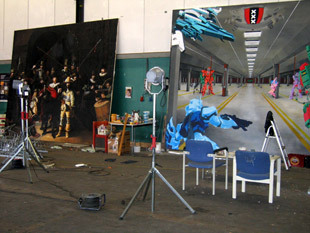 Two works in progress from the Night Watch project. These artists are re-interpreting this well-known work in a variety of ways. One of the most interesting to me was a painting where the artist painted the same scene and in the same style as Rembrandt’s Night Watch, but as if the action was taking place one minute later than the scene in the original...people had moved, the dog was busy, and some of the artist’s family were added! It is a clever and well painted twist on an old favourite. While at the warehouse, I met with some of the members of the Winston Group, a group of portrait artists based in Amsterdam. See their work at www.thewinstongroup.nl. We had a great exchange of ideas and energy, and I have been invited to join the group, and collaborate on their next project! All very exciting for me…watch this space! I am leaving at the end of the month of March on a month - long trip to Amsterdam to further my studies. I am especially looking forward to the Dutch Portraiture show at the Mauritshuis in Den Haag. 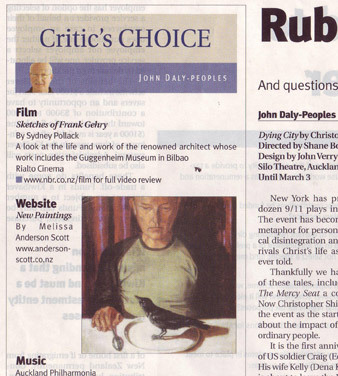 National Business Review has chosen this site as Critic’s Choice for their Arts page of Feb 16th, 2007. The response to the site has been fantastic. It gives an artist, working largely in isolation, such a boost to read your responses to both the art work and the site itself! It has also been great to renew contact with people on my mailing list who I have not been in touch with for a while. The result of all this excitement has been an increase in output on my part. New paintings will be appearing on the site, if they are not already there! I am continuing my series of works painted in high contrast, artificial light, many involving objects on a table, or people grouped around that table. There is a quality of theatre about these works that I am finding interesting. “Still –life as drama…” I suppose the Dutch use of symbolism in still life has affected me, although I use it in such a different way. The big news is, of course, the establishment of the website! This is something new for me, and I am looking forward to using it as a place to display new works and describe new directions the work is taking. Melissa a finalist in the Wallace Art awards. I am very pleased to have been chosen as a Finalist in the recent Wallace Art awards with my work, “Dark Narrative.” (see photo) This large work is one of a series of paintings I have been concentrating on since the start of the year, following my return from a group show in Chicago at the end of 2005. These paintings, some of which can be seen on the Gallery page of this site, combine still life and tronjes or “people-paintings” in a symbolist and narrative way. 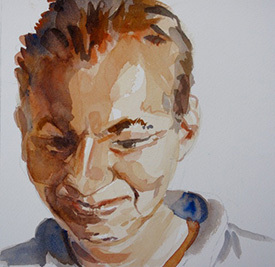 I am adapting the old Dutch layering techniques, exploring layers of colour, bright underpainting, and glazing choices that are describing the strong, directional, artificial light that is bathing the subjects. Classical influences are clear, but the subjects and symbols are very much of the modern day.